Marion Bowl is Senior Lecturer in Education in the School of Education, University of Birmingham. Her research specialisms are in the field of post-compulsory, adult and informal education and lifelong learning and in participatory and action research approaches. 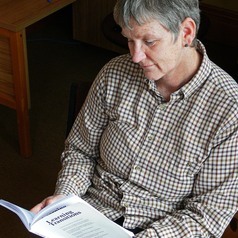 She has undertaken funded research for government and non-government agencies in New Zealand and, in the UK, has been a recipient of ESRC research funding. Her teaching ranges from one-to-one work with adult returners, to formal lecturing and PhD supervision. She has successfully supervised PhD students in England and New Zealand and been internal and external examiner and chair of PhD oral examinations on numerous occasions. Her training portfolio covers a spectrum from management training, to group work and interactive skills. She is a community worker, teacher and academic with over 30 years’ experience of developing, managing and researching adult and community education practice and policy in the U.K., West Africa and New Zealand. She is a member of two research centres which are based in the School of Education: the Centre for International Education and Research (CIER) and the Centre for Higher Education Equity and Access (CHEEA). She is also a member of the University Ethics Committee.